What It’s About: It is the late 1930s, and Kit Walker (Billy Zane) is The Phantom, the twenty-first in a long line of masked adventurers and crime fighters based in the fictional African nation of Bengalla. Kit travels from Bengalla to New York to Asia, all in a quest to stop business tycoon Xander Drax (Treat Williams) from gathering three mystic skulls and acquiring, what else, the power to rule the world. Why Watch it Today? : Lee Falk, who created the Phantom character and wrote the Phantom comic strip in which he debuted from 1936 until he died in 1999, was born today in 1911. 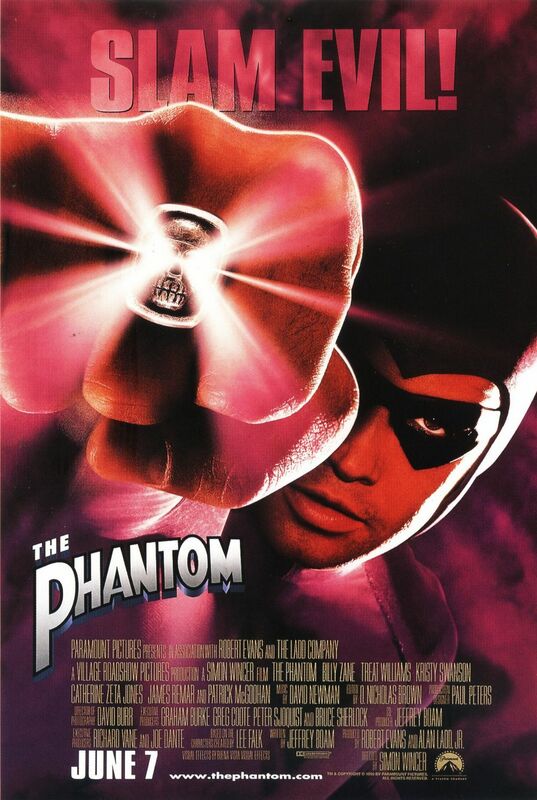 The Phantom is a rousing adventure film with a mostly game and attractive cast (though Williams tries way to hard and his villain, like the power of the skulls he seeks, is a bit underwhelming), old-fashioned serial-style adventure and action, beautiful scenery and a good sense of humor. This entry was posted in Adventure, Based on a Comic Strip, Event Film, Movie of the Day, Period Film, Pulp and tagged Billy Zane, Cary-Hiroyuki Tagawa, Catherine Zeta-Jones, cliffhangers, evil businessman, globe trotting, inherited the mantle, James Remar, Kristy Swanson, Lee Falk, MacGuffin, Patrick McGoohan, Samantha Eggar, The Phantom, Treat Williams.